The police in Lagos yesterday claimed that shallow graves were discovered at the residence of 70-year-old Prophet Emmanuel Adeyemi arrested for chaining his son and 27 others. 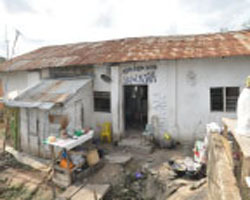 Police Commissioner Fatai Owoseni who confirmed the allegation said the place was raided following a tip-off that the suspect traded human parts to ritualists. He claimed that Adeyemi who was arrested alongside his first wife on Friday, buried some dead persons in the swamps and three others at his residence. “We got a tip-off that they were people he buried in that compound and he confirmed it during interrogation. “Because the area is swampy, the suspect had allegedly buried some people in the swamp and about three others in the house. “When we asked him of their identities he said it was some of his patients that were brought to his home from the hospital, after they were given up for dead, who finally died in his care and were buried in the swamp. Owoseni said Adeyemi was earlier invited for questioning after it was discovered that he put his son in chains. The Commissioner said the suspect claimed he chained the teenager, Toba Adedoyin Adeyemi in order to cure him from stealing. He said: “When we got information that a teenager was locked up in a house, the area G Commander invited the suspect, who claimed that his son was known for stealing and so he locked him up in chains to cure him of stealing. “While we were still on that case, we got another credible tip off that there were other people chained up in that same house. Of course, we carried out a raid and confirmed the allegation to be true. It was gathered that one of the victims who was feeble and had sores was currently on admission at a hospital, while the others were moved to the state rehabilitation centre.